Today, most people understand the concept of Open Source – certainly we expect most readers of this blog understand it. View the code, use the code, copy the code, change the code, and, depending on the license, contribute back changes or not. What many people don’t get, and something we here at Hyperledger and The Linux Foundation pride ourselves on doing well, is Open Governance. The Linux Foundation, and all of our 60+ open source projects, are not-for-profits building the greatest shared R&D investment in history. Open Governance is central to this promise. Open Governance means that technical decisions -– which features to add, how to add them and when, among others – for a given Open Source project or projects are made by a group of community-elected developers drawn from a pool of active participants. It is as close to the ideal of pure technical meritocracy as one can get and we strive continuously to reach that ideal. Hyperledger recently concluded the 2017-2018 Technical Steering Committee (TSC) election, and so we thought it an opportune time to explain the ABCs of Open Governance. Please note that this is one Open Governance implementation and clearly not the only way to do it, but rather one proven and effective way. What does the Hyperledger TSC do? The TSC charter spells out the group’s responsibilities. The TL;DR is that the TSC is the ultimate authority on technical decisions. This includes which new projects are admitted to Hyperledger , which current projects graduate from Incubation to Active , and the rules by which each Hyperledger project will operate. Participation in Hyperledger through becoming a Contributor and/or Maintainer is open to anyone. As a developer or maintainer, this translates into one thing: trust. You know how decisions will be made and the process by which people will be selected to make these decisions. Hyperledger is vendor-neutral and technical contributions are based on meritocracy. We will always remain immune to the commercial interests of any single company. Who is really eligible to be on the TSC? The charter spells out that the TSC voting members shall consist of eleven (11) elected Contributors or Maintainers chosen by the Active Contributors. So, how do you determine an active contributor, you may ask? As part of the current election, every project maintainer and Working Group leader was asked to provide a list of all the people that have contributed to their work in the past year. In addition, a review of all code and other contributions was conducted. This year, 424 active contributors were identified as eligible to participate in the TSC election process. The Linux Foundation maintains an expert staff with decades of combined experience managing the operations of large scale, Openly Governed Open Source projects. For Hyperledger, the Sr. Program Manager Todd Benzies ensures the trains run on time. This nominating process produced 32 candidates for the 11 TSC spots. These 32 come from 20 different organizations, across a spectrum of industries, from technology vendors to foundations to end users from a variety of industries. They include people who work at Hyperledger members and non-members and some are standing as individuals. A policy whose importance is hard to overstate is that anyone elected to a seat on the TSC is elected as a person unbound to the company for which they presently work. Should any TSC member during their tenure leave an employer for another, this would have zero impact on their standing as member of the Hyperledger TSC. Here is Todd’s email sent to the same list announcing the nominees and opening voting. The arrow highlights one of the things that we’ve learned along the way as a trick to the trade of running open governance well. The voting system has to be unquestionably secure and fair (something by now truly everyone can relate to…). We use the Condorcet Internet Voting System to safeguard the privacy of this election and voting process. CIVS can only be accessed by authorized voters, who receive a unique URL tied to their email address. Voters rank a set of possible choices and individual voter rankings are combined into an anonymous overall ranking of the choices. One vote is allowed per IP address. 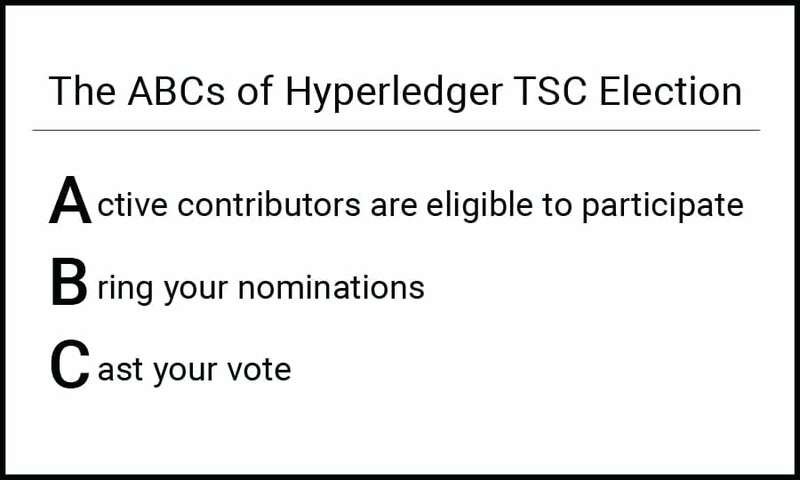 If you’re interested in learning more about the Hyperledger TSC and its elected members, we’ll be kicking off a “Meet the TSC” blog series in the coming weeks. Be sure to look out for it! You can plug into the community at github , Rocket.Chat the wiki or our mailing list .